Eighteenth Century Agrarian Business: Great day at Todd Farm! Great day at Todd Farm! 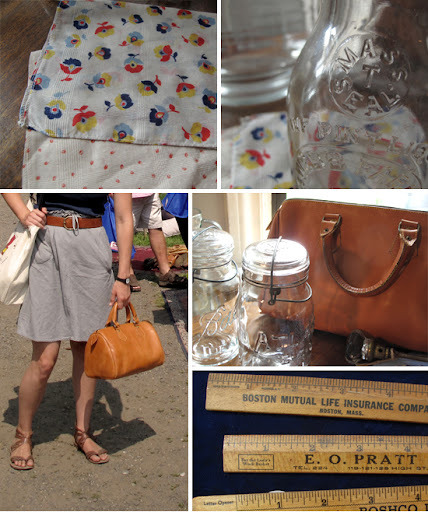 A quick post just to share about a great trip to Todd Farm Antique Market! [You can read my post about the market here] The morning was lovely and for the first time, for me, when we got there the front parking lot was full! I got two lovely, lovely print hankies ($1 each); an antique glass doorknob (my apt's bathroom has not had a doorknob at all since I've lived here! $9); a couple of small milk jars (one from Mass and one from Maine 2 for $5) and canning jars ($2 each); a fantastic structured, real leather satchel ($15) and a free Martha Stewart back issue (July 2002) to boot! It's only 30 miles north Boston folks, smell the grass, see the Colonial homes and get bargaining. I love that bag too much. You'll have to become a housecall-making country doctor.